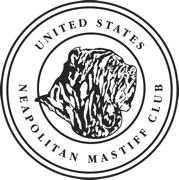 United States Neapolitan Mastiff Club This is our parent club. We have been breeders of the year for multiple years in our club and we are in good standing. This site have a lot of wonderful information on Neapolitan's. We are in great standing with AKC, For multiple years we have owned and exhibited some of the top neapolitan's and we owned and exhibited Bruno a History Making Neapolitan Mastiff, being the first to win a Best In Show for our breed. We are also listed by AKC as reputable breeders directly of Neapolitan Mastiff's.